Standby Generator Service, Repair, Installation Bloomington, IL | Wm. Masters, Inc. Mistakes, accidents, and acts of nature happen. It’s always a good idea to have a backup plan, especially when it comes to keeping your home or business in proper working order. Living in the midwest means that power outages aren’t a question of if, but a matter of when. From thunderstorms to tornadoes to winter-related weather, there are power outage risks in every season. A permanently installed standby generator protects against power outages for about the same cost as an air conditioning system. When an outage occurs, to rest easy and comfortably, you need to have power in your home. We put our trust in the quality automatic standby power generators manufactured by Generac, which detect outages within seconds and activate immediately to provide your home with the necessary power to keep your family safe and sound. These units are hands-free and powered by natural gas or propane. 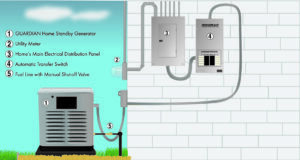 Click here to see a short video about: "What is a standby generator?" Wm. Masters has the experts that can help you choose the right backup generator for your home or business and the technicians to correctly install it for you. Learn more about protecting your home or business with the right backup generator by contacting us today.